The Raffles Institution (Year 5-6) Guitar Ensemble (RJGE) has risen to prominence to be one of the best full-fledged Niibori guitar ensembles in Singapore at the JC level under the baton of Mr. Michael Gaspar and Mr Raj. RJGE took part in several exciting performances and competitions in 2012, including the 6th Guitar Ensemble Competition, Raffles Rhapsody, and held our very own annual concert, Foverό 2012. The whole experience was not only rich but truly memorable for everyone. We put up renditions that were enjoyable to us and appealing to the audience. For example, in our 2012 concert Foverό, we put together a wide repertoire, ranging from classical and folk pieces like Core’ngrato & Only Love to current popular songs such as “Na Xie Nian”, an Adele medley and “Somebody that I Used to Know” which wowed the audience when our five guitarists showcased their skills and co-ordination playing skillfully on a single guitar. It was definitely a night to behold for the whole ensemble when we showcased our musical talent, exhibited great teamwork and enjoyed good fun. RJGE is looking forward to participating in the biennial Singapore Youth Festival (SYF) in 2013, where we will be performing two beautiful classical pieces, “Mountains in Autumn” and “Slovanic Dance No. 8”. Like in all performances, the best experience comes in the ample opportunities we will have, bonding and making music together as a family. Besides this, we will also be organizing a combined concert with the RI (Year 1-4) Guitar Ensemble. This concert will be the highlight of our RJGE year for we will let our creative juices flow and explore the various genres of music we can improvise and put together. With supportive and creative instructors who simply love good music, our ensemble is given the freedom to experiment, explore and enjoy. We are confident that our whole production will showcase a wide repertoire that the audience will truly enjoy. All Year 5 students are most welcome to join the RJGE for good music and great fun. You do not need any guitar background to join for technical lessons will be provided by your seniors. 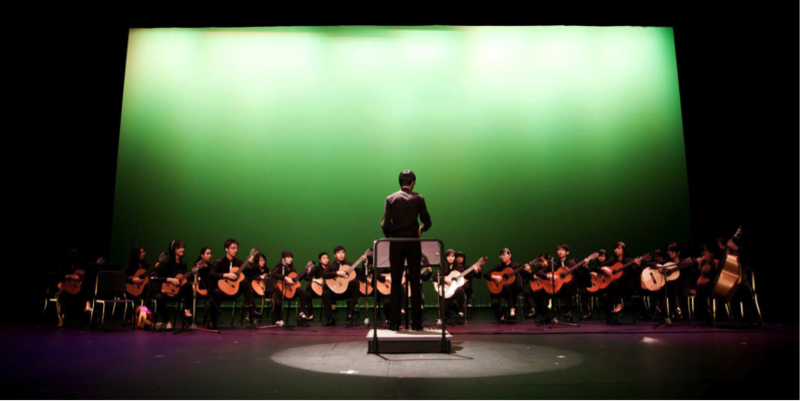 Those without guitar background will join the junior ensemble to perform at our annual concert, while those with sufficient guitar background will join the main ensemble with the Year 6 members to participate in SYF 2013 as well as perform at our annual concert. Our practices are held twice weekly, every Monday and Wednesday. Additional practices may be held on Saturday mornings, if necessary, prior to major performances. Everyone is welcome to the audition for this CCA. We promise you a fulfilling and amazing time in this ensemble which you will never regret. They advocate the power of speaking (an act of proactive, passionate personal articulation) over the power of speech (a detached oral delivery based on set requirements), and endeavour to move beyond a culture of passive preaching in all that they do. Why talk at people when you can speak to them? Meet Gavel Club.